Going on a holiday? Pet owners will understand the worry of leaving their beloved fur-friends behind everytime they go abroad. You've probably thought of engaging a pet-sitter, or are looking to entrust them with friends or family, but if those aren't viable options, why not consider checking Snowy into a luxury pet hotel instead? Here are seven options that you'll find in Singapore, the UK and United States. Nestled below Dempsey Hill in Singapore, The Waginton is a heritage colonial bungalow inspired by Edwardian design. The decadent Royal Suite pampers your companions with a queen-sized bed, chandelier with mood lighting, uninterrupted views of the balcony, a 32-inch LED television and gourmet in-room dining services. Furry guests also have access to an outdoor fibreglass dog pool for playtime in the sun. Felines are offered 5-star lodging with carpeted suites featuring individual air purification systems, around-the-clock climate control, and in-room Swarovski crystal feeding bowls. Humans have Hawaii, and pets have the Paradise Ranch. Located 20 minutes from downtown Los Angeles in the United States, the luxury pet resort features its very own Bora Bora Beach and Waikiki Beach, where dogs are free to lounge in the sun or splash in the waterpark. At night, pooches sleep in bedrooms with companionship from their canine friends and trained staff. Other services include doggie day care, dog training, and grooming. Cats are used to royal treatment, so they should expect nothing less from a hotel. Award-winning Longcroft Luxury Cat Hotel in the United Kingdom offers five-star services for your felines. From individually heated suites that boast luxury bedding and a separate play-area, to gourmet room service served on bone china, your cat will definitely be treated like a king. The hotel also offers spa services such as grooming and massage. Fancy a wellness retreat for your beloved pets? Located at West Palm Beach in Florida, Posh Pet Hotel features an impressive 103 rooms for cats and dogs, from a 16 square-foot classic suite to a 100 square-foot presidential suite furnished with a queen-sized bed, 42-inch HD television and crystal chandeliers. 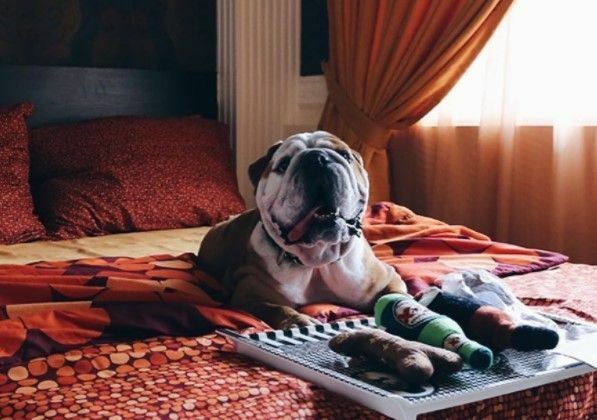 Presidential guests also enjoy 24-hour room service, belly scratches and bedtime tatler_tatler_stories. Besides its spa services, the best part of Posh Pet Hotel is its wellness programme, where pets can receive acupuncture or Chinese tui na massage, amongst other treatments. If you are taking a trip to Las Vegas with your pet, Luxe Pet Hotels will pick you up from the airport in a Cadillac. The luxury pet hotel boards your cats and dogs in their lavish doggy suites or kitty villas. Canine guests can tumble on queen or king-sized memory foam beds with a private 42-inch television and ambient mood lighting in their rooms. Playtime takes place in an air-conditioned indoor obstacle course zone, or the expansive 7000 square-foot outdoor pool cabana. Artisanal treats for pups and cats are freshly prepared in the kitchen, not to forget the gourmet meal options to choose from! A 50,000 square-foot pet care campus, The Barkley provides lodging for dogs, cats, birds as well as exotic pets. With veterinary partner VCA Westlake Village Animal Hospital just next door, your cherished pets are guaranteed 24/7 care. Sociable canine guests, especially, will love Doggie Day Camp in the 12,000 square-foot outdoor play area with K9 turf grass, cabana shading, and misting. With an extensive list of salon and spa services, your four-legged friends will leave the place looking like a star. D Pet Hotel Chelsea in New York is the best place to pamper a city dog, with its Uber suites furnished with a queen-sized bed and a flat screen television for your pup's private entertainment. Hotel amenities include three indoor dog parks, a gym, spa and grooming, and a private chef that prepares custom recipes for in-room dining. Chauffeuring services transport your pooch in style in a Ferrari, Lamborghini Gallardo, Bentley, Porsche or Rolls Royce. The hotel occasionally offers wellness programmes like Doga (dog yoga), meditation, and massage, which you can enjoy with your pet.